"Iconoclast" redirects here. For other uses, see Iconoclast (disambiguation). "Triumph of Orthodoxy" over iconoclasm under the Byzantine Empress Theodora and her son Michael III. 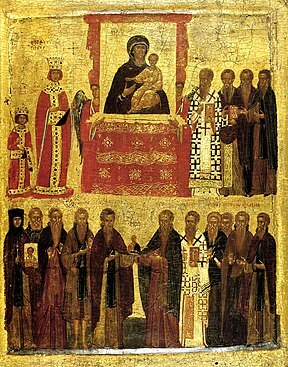 Late 14th – early 15th-century icon. Iconoclasm[Note 1] is the social belief in the importance of the destruction of icons and other images or monuments, most frequently for religious or political reasons. People who engage in or support iconoclasm are called iconoclasts, a term that has come to be applied figuratively to any individual who challenges "cherished beliefs or venerated institutions on the grounds that they are erroneous or pernicious". Conversely, one who reveres or venerates religious images is called (by iconoclasts) an iconolater; in a Byzantine context, such a person is called an iconodule or iconophile. The term does not generally encompass the specific destruction of images of a ruler after his death or overthrow (damnatio memoriae). Iconoclasm may be carried out by people of a different religion, but is often the result of sectarian disputes between factions of the same religion. Within Christianity, iconoclasm has generally been motivated by those who adopt a strict interpretation of the Ten Commandments, which forbid the making and worshipping of "graven images or any likeness of anything". The later Church Fathers identified Jews, fundamental iconoclasts, with heresy and saw deviations from orthodox Christianity and opposition to the veneration of images as heresies that were essentially "Jewish in spirit". The degree of iconoclasm among Christian branches greatly varies. Islam, in general, tends to be more iconoclastic than Christianity, with Sunni Islam being more iconoclastic than Shia Islam. In rebellion against the old religion and the powerful priests of Amun, Akhenaten ordered the eradication of all of Egypt's traditional gods. He sent royal officials to chisel out and destroy every reference to Amun and the names of other deities on tombs, temple walls, and cartouches to instill in the people that the Aten was the one true god. Public references to Akhenaten were destroyed soon after his death. For Egypt, the greatest horror was the destruction or abduction of the cult images. In the eyes of the Israelites, the erection of images meant the destruction of divine presence; in the eyes of the Egyptians, this same effect was attained by the destruction of images. In Egypt, iconoclasm was the most terrible religious crime; in Israel, the most terrible religious crime was idolatry. In this respect Osarseph alias Akhenaten, the iconoclast, and the Golden Calf, the paragon of idolatry, correspond to each other inversely, and it is strange that Aaron could so easily avoid the role of the religious criminal. It is more than probable that these traditions evolved under mutual influence. In this respect, Moses and Akhenaten became, after all, closely related. Although widespread use of Christian iconography only began as Christianity increasingly spread among gentiles after the legalization of Christianity by Roman Emperor Constantine (c. 312 AD), scattered expressions of opposition to the use of images were reported (e.g. Spanish Synod of Elvira). The period after the reign of Byzantine Emperor Justinian (527–565) evidently saw a huge increase in the use of images, both in volume and quality, and a gathering aniconic reaction. In the Eastern Roman (Byzantine) Empire, government-led iconoclasm began with Byzantine Emperor Leo III, following what seems to have been a long period of rising opposition to the use or misuse of images. The religious conflict created political and economic divisions in Byzantine society. It was generally supported by the Eastern, poorer, non-Greek peoples of the Empire who had to deal frequently with raids from the new Muslim Empire. On the other hand, the wealthier Greeks of Constantinople, and also the peoples of the Balkan and Italian provinces, strongly opposed iconoclasm. Within the Byzantine Empire the government had probably been adopting Christian images more frequently. One notable change came in 695, when Justinian II's government added a full-face image of Christ on the obverse of imperial gold coins. The change caused the Caliph Abd al-Malik to stop his earlier adoption of Byzantine coin types. He started a purely Islamic coinage with lettering only. A letter by the Patriarch Germanus written before 726 to two Iconoclast bishops says that "now whole towns and multitudes of people are in considerable agitation over this matter" but there is little written evidence of the debate. The first iconoclastic wave happened in Wittenberg in the early 1520s under reformers Thomas Müntzer and Andreas Karlstadt. It prompted Martin Luther, then concealing as Junker Jörg, to intervene. In contrast to the Lutherans who favoured sacred art in their churches and homes, the Reformed (Calvinist) leaders, in particular Andreas Karlstadt, Huldrych Zwingli and John Calvin, encouraged the removal of religious images by invoking the Decalogue's prohibition of idolatry and the manufacture of graven (sculpted) images of God. As a result, individuals attacked statues and images. However, in most cases, civil authorities removed images in an orderly manner in the newly Reformed Protestant cities and territories of Europe. 16th-century iconoclasm in the Protestant Reformation. Relief statues in St. Stevenskerk in Nijmegen, the Netherlands, were attacked and defaced by Calvinists in the Beeldenstorm. Looting of the Churches of Lyon by the Calvinists in 1562 by Antoine Caron. Destruction of religious images by the Reformed in Zurich, 1524. Remains of Calvinist iconoclasm, Clocher Saint-Barthélémy, La Rochelle, France. Significant iconoclastic riots took place in Basel (in 1529), Zurich (1523), Copenhagen (1530), Münster (1534), Geneva (1535), Augsburg (1537), Scotland (1559), Rouen (1560) and Saintes and La Rochelle (1562). Calvinist iconoclasm in Europe "provoked reactive riots by Lutheran mobs" in Germany and "antagonized the neighbouring Eastern Orthodox" in the Baltic region. The Seventeen Provinces (now the Netherlands, Belgium and parts of Northern France) were disrupted by widespread Calvinist iconoclasm in the summer of 1566. This is called the Beeldenstorm and began with the destruction of the statuary of the Monastery of Saint Lawrence in Steenvoorde after a "Hagenpreek", or field sermon, by Sebastiaan Matte. Hundreds of other attacks included the sacking of the Monastery of Saint Anthony after a sermon by Jacob de Buysere. The Beeldenstorm marked the start of the revolution against the Spanish forces and the Catholic Church. "Zwingli's attack on images, at the first debate, triggered iconoclastic incidents in Zurich and the villages under civic jurisdiction that the reformer was unwilling to condone." And due to this action of protest against authority, "Zwingli responded with a carefully reasoned treatise that men could not live in society without laws and constraint." Lord what work was here! What clattering of glasses! What beating down of walls! What tearing up of monuments! What pulling down of seats! What wresting out of irons and brass from the windows! What defacing of arms! What demolishing of curious stonework! What tooting and piping upon organ pipes! And what a hideous triumph in the market-place before all the country, when all the mangled organ pipes, vestments, both copes and surplices, together with the leaden cross which had newly been sawn down from the Green-yard pulpit and the service-books and singing books that could be carried to the fire in the public market-place were heaped together. Protestant Christianity was not uniformly hostile to the use of religious images. Martin Luther taught the "importance of images as tools for instruction and aids to devotion", stating: "If it is not a sin but good to have the image of Christ in my heart, why should it be a sin to have it in my eyes?" Lutheran churches retained ornate church interiors with a prominent crucifix, reflecting their high view of the real presence of Christ in Eucharist. As such, "Lutheran worship became a complex ritual choreography set in a richly furnished church interior." For Lutherans, "the Reformation renewed rather than removed the religious image." Within Muslim history, the act of removing idols from the Ka'ba in Mecca is considered by all believers to be of great symbolic and historical importance. In general, Muslim societies have avoided the depiction of living beings (animals and humans) within such sacred spaces as mosques and madrasahs. This opposition to figural representation is based not on the Qur'an, but on traditions contained within the Hadith. The prohibition of figuration has not always extended to the secular sphere, and a robust tradition of figural representation exists within Muslim art. However, Western authors have tended to perceive "a long, culturally determined, and unchanging tradition of violent iconoclastic acts" within Islamic society. The first act of Muslim iconoclasm dates to the beginning of Islam, in 630, when the various statues of Arabian deities housed in the Kaaba in Mecca were destroyed. There is a tradition that Muhammad spared a fresco of Mary and Jesus. This act was intended to bring an end to the idolatry which, in the Muslim view, characterized Jahiliyya. The destruction of the idols of Mecca did not, however, determine the treatment of other religious communities living under Muslim rule after the expansion of the caliphate. Most Christians under Muslim rule, for example, continued to produce icons and to decorate their churches as they wished. A major exception to this pattern of tolerance in early Islamic history was the "Edict of Yazīd", issued by the Umayyad caliph Yazid II in 722–723. This edict ordered the destruction of crosses and Christian images within the territory of the caliphate. Researchers have discovered evidence that the order was followed, particularly in present-day Jordan, where archaeological evidence shows the removal of images from the mosaic floors of some, although not all, of the churches that stood at this time. But, Yazīd's iconoclastic policies were not continued by his successors, and Christian communities of the Levant continued to make icons without significant interruption from the sixth century to the ninth. Certain conquering Muslim armies have used local temples or houses of worship as mosques. An example is Hagia Sophia in Istanbul (formerly Constantinople), which was converted into a mosque in 1453. Most icons were desecrated and the rest were covered with plaster. In the 1920s, Hagia Sophia was converted to a museum, and the restoration of the mosaics was undertaken by the American Byzantine Institute beginning in 1932. More dramatic cases of iconoclasm by Muslims are found in parts of India where Hindu and Buddhist temples were razed and mosques erected in their place. Aurangzeb destroyed the famous Hindu temples at Varanasi and Mathura, and even went as far as Afghanistan to attempt (unsuccessfully) to destroy the Bamyan Buddhas—a task that was later completed by Islamist Taliban. Certain Muslim denominations continue to pursue iconoclastic agendas. There has been much controversy within Islam over the recent and apparently on-going destruction of historic sites by Saudi Arabian authorities, prompted by the fear they could become the subject of "idolatry". A recent act of iconoclasm was the 2001 destruction of the giant Buddhas of Bamyan by the then-Taliban government of Afghanistan. The act generated worldwide protests and was not supported by other Muslim governments and organizations. It was widely perceived in the Western media as a result of the Muslim prohibition against figural decoration. Such an account overlooks "the coexistence between the Buddhas and the Muslim population that marveled at them for over a millennium" before their destruction. The Buddhas had twice in the past been attacked by Nadir Shah and Aurengzeb. According to the art historian F.B. Flood, analysis of the Taliban's statements regarding the Buddhas suggest that their destruction was motivated more by political than by theological concerns. Taliban spokespeople have given many different explanations of the motives for the destruction. During the Tuareg rebellion of 2012, the radical Islamist militia Ansar Dine destroyed various Sufi shrines from the 15th and 16th centuries in the city of Timbuktu, Mali. In 2016, the International Criminal Court (ICC) sentenced Ahmad al-Faqi al-Mahdi, a former member of Ansar Dine, to nine years in prison for this destruction of cultural world heritage. This was the first time that the ICC convicted a person for such a crime. The short-lived Islamic State of Iraq and the Levant carried out iconoclastic attacks such as the destruction of Shia mosques and shrines. Notable incidents include blowing up the Mosque of the Prophet Yunus (Jonah) and destroying the Shrine to Seth in Mosul. According to the Hebrew Bible, the Israelites entering the Promised Land were instructed by God to 'destroy all [the] engraved stones, destroy all [the] molded images, and demolish all [the] high places' of the Canaanite indigenous population. In Judaism, King Hezekiah purged Solomon's Temple in Jerusalem and the Land of Israel of figures, including the Nehushtan, as recorded in the Second Book of Kings. His reforms were reversed in the reign of his son Manasseh. In 305–306, the Synod of Elvira appeared to endorse iconoclasm. Canon 36 states, "Pictures are not to be placed in churches, so that they do not become objects of worship and adoration. "[Note 3] Proscription ceased after the destruction of pagan temples. During the process of Christianisation under Constantine, Christian groups destroyed the images and sculptures expressive of the Roman Empire's polytheist state religion. Many of the moai of Easter Island were toppled during the 18th century in the iconoclasm of civil wars before any European encounter. Other instances of iconoclasm may have occurred throughout Eastern Polynesia during its conversion to Christianity in the 19th century. After the Second Vatican Council in the late twentieth century, some Roman Catholic parish churches discarded much of their traditional imagery, art, and architecture. According to an article in Buddhist-Christian Studies: "Over the course of the last decade [1990s] a fairly large number of Buddhist temples in South Korea have been destroyed or damaged by fire by Christian fundamentalists. More recently, Buddhist statues have been identified as idols, and attacked and decapitated in the name of Jesus. Arrests are hard to effect, as the arsonists and vandals work by stealth of night." Revolutions and changes of regime, whether through uprising of the local population, foreign invasion, or a combination of both, are often accompanied by the public destruction of statues and monuments identified with the previous regime. This may also be known as damnatio memoriae, the ancient Roman practice of official obliteration of the memory of a specific individual. Stricter definitions of "iconoclasm" exclude both types of action, reserving the term for religious or more widely cultural destruction. In many cases, such as Revolutionary Russia or Ancient Egypt, this distinction can be hard to make. Among Roman emperors and other political figures subject to decrees of damnatio memoriae were Sejanus, Publius Septimius Geta, and Domitian. Several Emperors, such as Domitian and Commodus had during their reigns erected numerous statues of themselves, which were pulled down and destroyed when they were overthrown. Throughout the radical phase of the French Revolution, iconoclasm was supported by members of the government as well as the citizenry. Numerous monuments, religious works, and other historically significant pieces were destroyed in an attempt to eradicate any memory of the Old Regime. At the same time, the republican government felt responsible to preserve these works for their historical, aesthetic, and cultural value. One way the republican government succeeded in their paradoxical mission of preserving and destroying symbols of the Old Regime was through the development of museums. During the Revolution, a statue of King Louis XV in the Paris square which until then bore his name, was pulled down and destroyed. This was a prelude to the guillotining of his successor Louis XVI in the same site, renamed "Place de la Révolution" (at present Place de la Concorde). The statue of Napoleon on the column at Place Vendôme, Paris was also the target of iconoclasm several times: destroyed after the Bourbon Restoration, restored by Louis-Philippe, destroyed during the Paris Commune and restored by Adolphe Thiers. The Somnath Temple in Gujarat was repeatedly destroyed by Islamic armies and rebuilt by Hindus. It was destroyed by Delhi Sultanate's army in 1299 CE. The present temple was reconstructed in Chaulukya style of Hindu temple architecture and completed in May 1951. 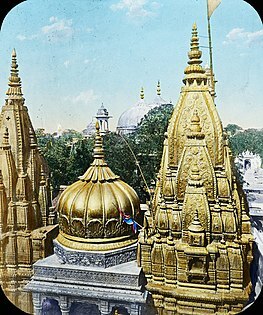 The Kashi Vishwanath Temple was destroyed by the army of Qutb-ud-din Aibak. Ruins of the Martand Sun Temple. The temple was completely destroyed on the orders of Muslim Sultan Sikandar Butshikan in the early 15th century, with demolition lasting a year. 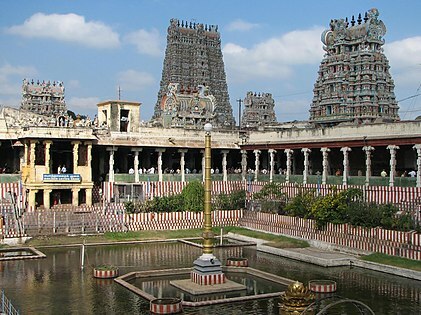 The armies of Delhi Sultanate led by Muslim Commander Malik Kafur plundered the Meenakshi Temple and looted it of its valuables. 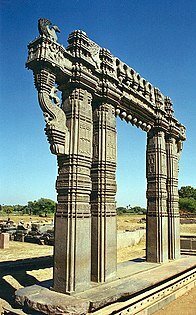 Kakatiya Kala Thoranam (Warangal Gate) built by the Kakatiya dynasty in ruins; one of the many temple complexes destroyed by the Delhi Sultanate. Rani ki vav is a stepwell, built by the Chaulukya dynasty, located in Patan; the city was sacked by Sultan of Delhi Qutb-ud-din Aybak between 1200 and 1210, and it was destroyed by the Allauddin Khilji in 1298. 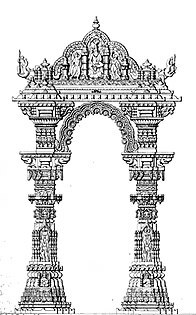 Artistic rendition of the Kirtistambh at Rudra Mahalaya Temple. 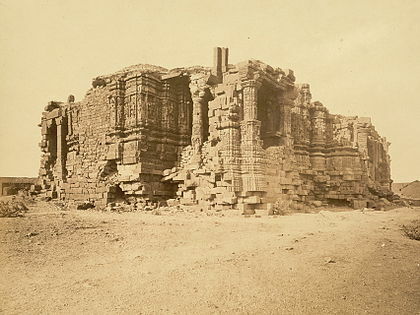 The temple was destroyed by Alauddin Khalji. 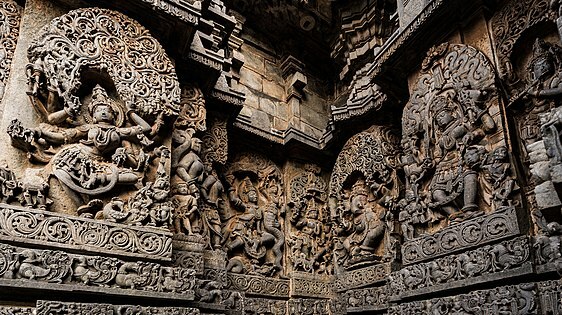 Exterior wall reliefs at Hoysaleswara Temple. The temple was twice sacked and plundered by the Delhi Sultanate. 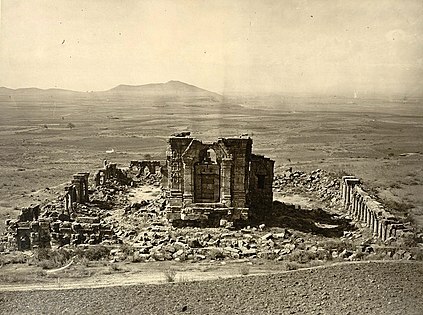 Records from the campaign recorded in the Chach Nama record the destruction of temples during the early eighth century when the Umayyad governor of Damascus, al-Hajjaj ibn Yusuf, mobilized an expedition of 6000 cavalry under Muhammad bin Qasim in 712. Muhammad triumphantly marched into the country, conquering Debal, Sehwan, Nerun, Brahmanadabad, Alor and Multan one after the other in quick succession, and in less than a year and a half, the far-flung Hindu kingdom was crushed ... There was a fearful outbreak of religious bigotry in several places and temples were wantonly desecrated. At Debal, the Nairun and Aror temples were demolished and converted into mosques. In 725 Junayad, the governor of Sind, sent his armies to destroy the second Somnath. In 1024, the temple was again destroyed by Mahmud of Ghazni, who raided the temple from across the Thar Desert. The wooden structure was replaced by Kumarapala (r. 1143–72), who rebuilt the temple out of stone. Sultan Sikandar Butshikan of Kashmir (1389–1413) ordered the breaking of all "golden and silver images". Firishta states, "After the emigration of the Bramins, Sikundur ordered all the temples in Kashmeer to be thrown down. Having broken all the images in Kashmeer, (Sikandar) acquired the title of 'Destroyer of Idols'". There have been a number of anti-Buddhist campaigns in Chinese history that led to the destruction of Buddhist temples and images. One of the most notable of these campaigns was the Great Anti-Buddhist Persecution of the Tang dynasty. During and after the Xinhai Revolution, there was widespread destruction of religious and secular images in China. During the Northern Expedition in Guangxi in 1926, Kuomintang General Bai Chongxi led his troops in destroying Buddhist temples and smashing Buddhist images, turning the temples into schools and Kuomintang party headquarters. It was reported that almost all of the viharas in Guangxi were destroyed and the monks were removed. Bai also led a wave of anti-foreignism in Guangxi, attacking Americans, Europeans, and other foreigners, and generally making the province unsafe for foreigners and missionaries. Westerners fled from the province and some Chinese Christians were also attacked as imperialist agents. The three goals of the movement were anti-foreignism, anti-imperialism and anti-religion. Bai led the anti-religious movement against superstition. Huang Shaohong, also a Kuomintang member of the New Guangxi clique, supported Bai's campaign. The anti-religious campaign was agreed upon by all Guangxi Kuomintang members. There was extensive destruction of religious and secular imagery in Tibet after it was invaded and occupied by China. Many religious and secular images were destroyed during the Cultural Revolution of 1966-1976, ostensibly because they were a holdover from China's traditional past (which the Communist regime led by Mao Zedong reviled). The Cultural Revolution included widespread destruction of historic artworks in public places and private collections, whether religious or secular. Objects in state museums were mostly left intact. During and after the October Revolution, widespread destruction of religious and secular imagery took place, as well as the destruction of imagery related to the Imperial family. The Revolution was accompanied by destruction of monuments of past tsars, as well as the destruction of imperial eagles at various locations throughout Russia. According to Christopher Wharton, "In front of a Moscow cathedral, crowds cheered as the enormous statue of Tsar Alexander III was bound with ropes and gradually beaten to the ground. After a considerable amount of time, the statue was decapitated and its remaining parts were broken into rubble". 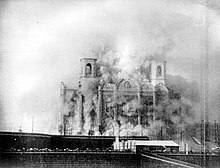 The Soviet Union actively destroyed religious sites, including Russian Orthodox churches and Jewish cemeteries, in order to discourage religious practice and curb the activities of religious groups. During the Hungarian Revolution of 1956 and during the Revolutions of 1989, protesters often attacked and took down sculptures and images of Joseph Stalin, such as the Stalin Monument in Budapest. The fall of Communism in 1989-1991 was also followed by the destruction or removal of statues of Vladimir Lenin and other Communist leaders in the former Soviet Union and in other Eastern Bloc countries. Particularly well-known was the destruction of "Iron Felix", the statue of Felix Dzerzhinsky outside the KGB's headquarters. Another statue of Dzerzhinsky was destroyed in a Warsaw square that was named after him during communist rule, but which is now called Bank Square. Michael Servetus in prison, by Clothilde Roch. Monument in Annemasse, France - destroyed by the Vichy Government in 1942, restored in 1960. Statue of William of Orange formerly located on College Green, in Dublin. 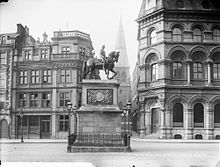 Erected in 1701, it was destroyed in 1929 - one of several memorials of British rule destroyed once Ireland achieved independence. 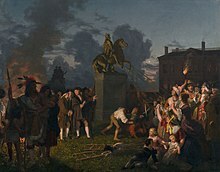 During the American Revolution, the Sons of Liberty pulled down and destroyed the gilded lead statue of George III of the United Kingdom on Bowling Green (New York City), melting it down to be recast as ammunition. Similar acts have accompanied the independence of most ex-colonial territories. Sometimes relatively intact monuments are moved to a collected display in a less prominent place, as in India and also post-Communist countries. From the 16th through the 19th centuries, many of the polytheistic religious deities and texts of pre-colonial Americas, Oceania and Africa were destroyed by Christian missionaries and their converts, such as during the Spanish conquest of the Aztec Empire and the Spanish conquest of the Inca Empire. There have been several cases of removing symbols of past rulers in Malta's history. Many Hospitaller coats of arms on buildings were defaced during the French occupation of Malta in 1798–1800; a few of these were subsequently replaced by British coats of arms in the early 19th century. Some British symbols were also removed by the government after Malta became a republic in 1974. These include royal cyphers being ground off from post boxes, and British coats of arms such as that on the Main Guard building being temporarily obscured (but not destroyed). In 1942 the pro-Nazi Vichy Government of France took down and melted Clothilde Roch's statue of the 16th-century dissident intellectual Michael Servetus, who had been burned at the stake in Geneva at the instigation of Calvin. The Vichy authorities disliked the statue, as it was a celebration of freedom of conscience. In 1960, having found the original molds, the municipality of Annemasse had it recast and returned the statue to its previous place. The Taliban destroyed two ancient Buddhas of Bamiyan in Bamyan, Afghanistan in March 2001. The Battle of Baghdad symbolically ended with the Firdos Square statue destruction, a US military-staged event in April 2003 where a prominent statue of Saddam Hussein was pulled down. In 2016, paintings from the University of Cape Town were burned in student protests as symbols of colonialism. In August 2017 a statue of a Confederate soldier dedicated to "the boys who wore the gray" was pulled down from its pedestal in front of Durham County Courthouse in North Carolina by protesters. This followed the events at the 2017 Unite the Right rally in response to growing calls to remove Confederate monuments and memorials across the U.S.
^ Literally, "image-breaking", from Ancient Greek: εἰκών and κλάω. Iconoclasm may be also considered as a back-formation from iconoclast (from Greek εἰκοκλάστης). The corresponding Greek word for iconoclasm is εἰκονοκλασία – eikonoklasia. ^ al-Maqrīzī, writing in the 15th century, attributes the damage to Muhammad Sa'im al-Dahr, a Sufi Muslim from the khanqah of Sa'id al-Su'ada, in 1378. ^ A possible translation is also: "There shall be no pictures in the church, lest what is worshipped and adored should be depicted on the walls." ^ OED, "Iconoclast, 2", see also "Iconoclasm" and "Iconoclastic". ^ "icono-, comb. form". OED Online. Oxford University Press. Retrieved March 28, 2019. ^ Michael, Robert (2011). A history of Catholic antisemitism : the dark side of the church (1st Palgrave Macmillan pbk. ed.). New York: Palgrave Macmillan. pp. 28–30. ISBN 978-0-230-11131-8. Retrieved 9 February 2015. ^ "Akhenaten". Encyclopedia.com. Retrieved 2015-12-31. ^ Jan Assmann, From Akhenaten to Moses: Ancient Egypt and Religious Change, pg. 76, 2014, The American University in Cairo Press, ISBN 977-416-631-0. ^ "Byzantine iconoclasm". Retrieved 2013-04-30. ^ Cyril Mango, The Oxford History of Byzantium, 2002. ^ Robin Cormack, Writing in Gold, Byzantine Society and its Icons, 1985, George Philip, London, ISBN 0-540-01085-5. ^ C Mango, "Historical Introduction", in Bryer & Herrin, eds., Iconoclasm, pp. 2–3., 1977, Centre for Byzantine Studies, University of Birmingham, ISBN 0-7044-0226-2. ^ a b Lamport, Mark A. (31 August 2017). Encyclopedia of Martin Luther and the Reformation. Rowman & Littlefield Publishers. p. 138. ISBN 9781442271593. Lutherans continued to worship in pre-Reformation churches, generally with few alterations to the interior. It has even been suggested that in Germany to this day one finds more ancient Marian altarpieces in Lutheran than in Catholic churches. Thus in Germany and in Scandinavia many pieces of medieval art and architecture survived. Joseph Leo Koerner has noted that Lutherans, seeing themselves in the tradition of the ancient, apostolic church, sought to defend as well as reform the use of images. "An empty, white-washed church proclaimed a wholly spiritualized cult, at odds with Luther's doctrine of Christ's real presence in the sacraments" (Koerner 2004, 58). In fact, in the 16th century some of the strongest opposition to destruction of images came not from Catholics but from Lutherans against Calvinists: "You black Calvinist, you give permission to smash our pictures and hack our crosses; we are going to smash you and your Calvinist priests in return" (Koerner 2004, 58). Works of art continued to be displayed in Lutheran churches, often including an imposing large crucifix in the sanctuary, a clear reference to Luther's theologia crucis. ... In contrast, Reformed (Calvinist) churches are strikingly different. Usually unadorned and somewhat lacking in aesthetic appeal, pictures, sculptures, and ornate altar-pieces are largely absent; there are few or no candles; and crucifixes or crosses are also mostly absent. ^ a b Felix, Steven (30 January 2015). Pentecostal Aesthetics: Theological Reflections in a Pentecostal Philosophy of Art and Aesthetics. Brill Academic Publishers. p. 22. ISBN 9789004291621. Luther's view was that biblical images could be used as teaching aids,and thus had didactic value. Hence Luther stood against the destruction of images whereas several other reformers (Karlstadt, Zwingli, Calvin) promoted these actions. In the following passage, Luther harshly rebukes Karlstadt on his stance on iconoclasm and his disorderly conduct in reform. ^ Stark, Rodney (18 December 2007). The Victory of Reason: How Christianity Led to Freedom, Capitalism, and Western Success. Random House Publishing Group. p. 176. ISBN 9781588365002. The Beeldenstorm, or Iconoclastic Fury, involved roving bands of radical Calvinists who were utterly opposed to all religious images and decorations in churches and who acted on their beliefs by storming into Catholic churches and destroying all artwork and finery. ^ Byfield, Ted (2002). A Century of Giants, A.D. 1500 to 1600: In an Age of Spiritual Genius, Western Christendom Shatters. Christian History Project. p. 297. ISBN 9780968987391. Devoutly Catholic but opposed to Inquisition tactics, they backed William of Orange in subduing the Calvinist uprising of the Dutch beeldenstorm on behalf of regent Margaret of Parma, and had come willingly to the council at her invitation. ^ Kamil, Neil (2005-02-11). Neil Kamil, Fortress of the soul: violence, metaphysics, and material life, p. 148. ISBN 9780801873904. Retrieved 2013-04-30. ^ Wandel, Lee Palmer (1995). Voracious Idols and Violent Hands. Cambridge, UK: Press Syndicate of the University of Cambridge. p. 149. ISBN 978-0-521-47222-7. ^ Marshall, Peter (22 October 2009). The Reformation. Oxford University Press. p. 114. ISBN 9780191578885. Iconoclastic incidents during the Calvinist 'Second Reformation' in Germany provoked reactive riots by Lutheran mobs, while Protestant image-breaking in the Baltic region deeply antagonized the neighbouring Eastern Orthodox, a group with whom reformers might have hoped to make common cause. ^ Kleiner, Fred S. (1 January 2010). Gardner's Art through the Ages: A Concise History of Western Art. Cengage Learning. p. 254. ISBN 9781424069224. In an episode known as the Great Iconoclasm, bands of Calvinists visited Catholic churches in the Netherlands in 1566, shattering stained-glass windows, smashing statues, and destroying paintings and other artworks they perceived as idolatrous. ^ Wallace, Peter George. The Long European Reformation: Religion, Political Conflict, and the Search for Conformity, 1350–1750. Houndmills, Basingstoke, Hampshire: Palgrave Macmillan, 2004. p. 95. ^ Naaeke, Anthony Y. (2006). Kaleidoscope Catechesis: Missionary Catechesis in Africa, Particularly in the Diocese of Wa in Ghana. Peter Lang. p. 114. ISBN 9780820486857. Although some reformers, such as John Calvin and Ulrich Zwingli, rejected all images, Martin Luther defended the importance of images as tools for instruction and aids to devotion. ^ Noble, Bonnie (2009). Lucas Cranach the Elder: Art and Devotion of the German Reformation. University Press of America. pp. 67–69. ISBN 9780761843375. ^ a b Spicer, Andrew (5 December 2016). 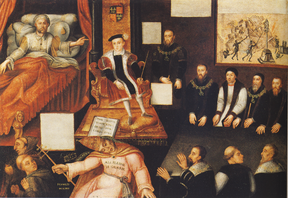 Lutheran Churches in Early Modern Europe. Taylor & Francis. p. 237. ISBN 9781351921169. As it developed in north-eastern Germany, Lutheran worship became a complex ritual choreography set in a richly furnished church interior. This much is evident from the background of an epitaph pained in 1615 by Martin Schulz, destined for the Nikolaikirche in Berlin (see Figure 5.5.). ^ Dixon, C. Scott (9 March 2012). Contesting the Reformation. John Wiley & Sons. p. 146. ISBN 9781118272305. According to Koerner, who dwells on Lutheran art, the Reformation renewed rather than removed the religious image. ^ a b c d Flood, Finbarr Barry (2002). "Between cult and culture: Bamiyan, Islamic iconoclasm, and the museum". The Art Bulletin. 84 (4): 641–659. doi:10.2307/3177288. JSTOR 3177288. ^ Guillaume, Alfred (1955). The Life of Muhammad. A translation of Ishaq's "Sirat Rasul Allah". Oxford University Press. p. 552. ISBN 978-0-19-636033-1. Retrieved 2011-12-08. Quraysh had put pictures in the Ka'ba including two of Jesus son of Mary and Mary (on both of whom be peace!). ... The apostle ordered that the pictures should be erased except those of Jesus and Mary. ^ A. Grabar, L'iconoclasme byzantin: le dossier archéologique (Paris, 1984), 155–56. ^ King, G. R. D. (1985). "Islam, iconoclasm, and the declaration of doctrine". Bulletin of the School of Oriental and African Studies. 48 (2): 276–7. doi:10.1017/s0041977x00033346. ^ Pauwels, Heidi; Bachrach, Emilia (2018). "Aurangzeb as Iconoclast? Vaishnava Accounts of the Krishna images' Exodus from Braj". Journal of the Royal Asiatic Society. 28 (3): 485–508. doi:10.1017/S1356186318000019. ISSN 1356-1863. ^ Howden, Daniel (August 6, 2005). "Independent Newspaper on-line, London, Jan 19, 2007". News.independent.co.uk. Archived from the original on September 8, 2008. Retrieved April 30, 2013. ^ Tharoor, Ishaan (2012-07-02). "Timbuktu's Destruction: Why Islamists Are Wrecking Mali's Cultural Heritage". TIME. Retrieved 10 July 2012. ^ "Nine Years for the Cultural Destruction of Timbuktu". The Atlantic. 2016-09-27. Retrieved 21 October 2017. ^ "Iraq jihadists blow up 'Jonah's tomb' in Mosul". The Telegraph. Agence France-Presse. 25 July 2014. Retrieved 25 July 2014. ^ "ISIS destroys Prophet Sheth shrine in Mosul". Al Arabiya News. 26 July 2014. ^ Elvira canons, Cua, archived from the original on 2012-09-05, Placuit picturas in ecclesia esse non debere, ne quod colitur et adoratur in parietibus depingatur . ^ The Catholic Encyclopedia, This canon has often been urged against the veneration of images as practised in the Catholic Church. Binterim, De Rossi, and Hefele interpret this prohibition as directed against the use of images in overground churches only, lest the pagans should caricature sacred scenes and ideas; Von Funk, Termel, and Henri Leclercq opine that the council did not pronounce as to the liceity or non-liceity of the use of images, but as an administrative measure simply forbade them, lest new and weak converts from paganism should incur thereby any danger of relapse into idolatry, or be scandalized by certain superstitious excesses in no way approved by the ecclesiastical authority. ^ Fischer, Steven Roger. Island at the end of the World – The Turbulent History of Easter Island. Reaktion Books Ltd. 2005. ISBN 1-86189-282-9. See page 64. ^ Chessman, Stuart. "The Society of St. Hugh of Cluny » Post Topic » Hetzendorf and the Iconoclasm in the Second Half of the 20th Century". Sthughofcluny.org. Retrieved 2013-04-30. ^ Idzerda, Stanley J. (1954). "Iconoclasm during the French Revolution". The American Historical Review. 60/1 (1): 13–26. doi:10.2307/1842743. JSTOR 1842743. ^ Gopal, Ram (1994). Hindu culture during and after Muslim rule: survival and subsequent challenges. M.D. Publications Pvt. Ltd. p. 148. ISBN 81-85880-26-3. ^ Jaffrelot, Christophe (1996). The Hindu nationalist movement and Indian politics: 1925 to the 1990s. C. Hurst & Co. Publishers. p. 84. ISBN 1-85065-170-1. ^ Robert Bradnock; Roma Bradnock (2000). India Handbook. McGraw-Hill. p. 959. ISBN 978-0-658-01151-1. ^ Sindhi Culture by U. T. Thakkur, Univ. of Bombay Publications, 1959. ^ "Leaves from the past". Archived from the original on 2007-01-10. ^ "Gujarat State Portal | All About Gujarat | Gujarat Tourism | Religious Places | Somnath Temple". Gujaratindia.com. Retrieved 2013-04-30. ^ Somnath Temple, British Library. ^ Firishta, Muhammad Qāsim Hindū Shāh (1981) . Tārīkh-i-Firishta [History of the Rise of the Mahomedan Power in India]. Translated by John Briggs. New Delhi. ^ Diana Lary (1974). Region and nation: the Kwangsi clique in Chinese politics, 1925–1937. Cambridge University Press. p. 98. ISBN 978-0-521-20204-6. Retrieved 2010-06-28. ^ Don Alvin Pittman (2001). Toward a modern Chinese Buddhism: Taixu's reforms. University of Hawaii Press. p. 146. ISBN 978-0-8248-2231-6. Retrieved 2010-06-28. ^ Diana Lary (1974). Region and nation: the Kwangsi clique in Chinese politics, 1925–1937. Cambridge University Press. p. 99. ISBN 978-0-521-20204-6. Retrieved 2010-06-28. ^ Karan, P. P. (2015). "Suppression of Tibetan Religious Heritage". The Changing World Religion Map. Springer, Dordrecht. pp. 461–476. doi:10.1007/978-94-017-9376-6_23. ISBN 9789401793759. ^ Auyezov, Olzhas (January 5, 2011). "Ukraine says blowing up Stalin statue was terrorism". Reuters. Retrieved 9 April 2011. ^ Ellul, Michael (1982). "Art and Architecture in Malta in the Early Nineteenth Century" (PDF). Melitensia Historica: 4–5. Archived from the original (PDF) on 11 October 2016. ^ Westcott, Kathryn (18 January 2013). "Letter boxes: The red heart of the British streetscape". BBC. Archived from the original on 26 November 2016. ^ Bonello, Giovanni (14 January 2018). "Mysteries of the Main Guard inscription". Times of Malta. Archived from the original on 14 January 2018. ^ "Afghan Taliban leader orders destruction of ancient statues". Rawa.org. Retrieved 2013-04-30. ^ Meintjies, Ilze-Marie (16 February 2016). "Protesting UCT Students Burn Historic Paintings, Refuse To Leave". Eyewitness News. Retrieved 19 February 2016. ^ "SEE IT: Crowd pulls down Confederate statue in North Carolina". NY Daily News. Retrieved 2017-08-15. ^ Holland, Jesse J. "Deadly rally accelerates ongoing removal of Confederate statues across U.S." chicagotribune.com. Retrieved 2017-08-15. ^ "War over Confederate statues reveals simple thinking on all sides". NY Daily News. Retrieved 2017-08-28. ^ CNN, Amanda Jackson. "Protesters pull down Confederate statue in North Carolina". CNN. Retrieved 2017-08-15. Aston, Margaret. Broken Idols of the English Reformation (Cambridge UP, 2016). Barasch, Moshe (1992). Icon: Studies in the History of an Idea. University of New York Press. ISBN 978-0-8147-1172-9. Besançon, Alain (2009). The Forbidden Image: An Intellectual History of Iconoclasm. University of Chicago Press. ISBN 978-0-226-04414-9. Bevan, Robert (2006). The Destruction of Memory: Architecture at War. Reaktion Books. ISBN 978-1-86189-319-2. Gamboni, Dario (1997). The Destruction of Art: Iconoclasm and Vandalism since the French Revolution. Reaktion Books. ISBN 978-1-86189-316-1. Gwynn, David M (2007). "From Iconoclasm to Arianism: The Construction of Christian Tradition in the Iconoclast Controversy" (PDF). Greek, Roman, and Byzantine Studies. 47: 225–251. Ivanovic, Filip (2010). Symbol and Icon: Dionysius the Areopagite and the Iconoclastic Crisis. Pickwick. ISBN 978-1-60899-335-2. Karahan, Anne (2014). "Byzantine Iconoclasm: Ideology and Quest for Power". In: Eds. K. Kolrud and M. Prusac, Iconoclasm from Antiquity to Modernity, Ashgate Publishing Ltd: Farnham, Surrey, pp. 75–94. ISBN 978-1-4094-7033-5. Lambourne, Nicola (2001). War Damage in Western Europe: The Destruction of Historic Monuments During the Second World War. Edinburgh University Press. ISBN 978-0-7486-1285-7. Narain, Harsh (1993). The Ayodhya Temple Mosque Dispute: Focus on Muslim Sources. Delhi: Penman Publishers. Look up iconoclasm or iconoclast in Wiktionary, the free dictionary. Wikimedia Commons has media related to Iconoclasm.